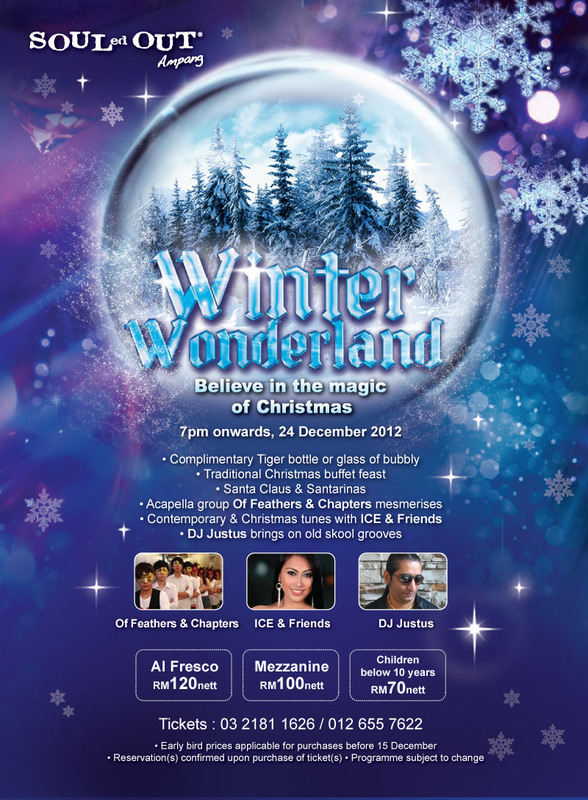 You will believe in the magic of Christmas again as SOULed OUT Ampang is converted into a winter wonderland with twinkling lights and a cool wintry white and blue atmosphere. To bring on the merry mood, acapella group Of Feathers & Chapters, songstress Ice & Friends and DJ Justus is sure to get all on the dance floor. An eclectic Christmas buffet that will satiate any appetite with dishes such as Caprese Salad, Roast Turkey, Seafood Smorgasbord, Thai Red Curry Seabass, Roast Jamaican Style Peri-Peri Striploin, English Plum Cake and loads more. Complement this feast with your favourite drink from our selection of champagne, wine, cocktails and spirits. Ticket prices: Adults RM120 nett (Al Fresco) or RM100 nett (Mezzanine) with complimentary bottle of Tiger or glass of bubbly. Child RM70 nett (Al Fresco). Why not celebrate it there? !